Paintball, like business, is about thinking tactically; employing strategies and working as a group to overcome obstacles and achieve target objectives. It requires creative thinking, teamwork, and sheer determination to succeed - which is why more and more companies are taking advantage of the benefits of The Paintball Co. This refillable tank meets or exceeds ASTM standards. Features new Safe Link™ safety valve. Expect 500-800 shots per fill. Paintball Equipment is a game played among two teams and is focused on company structure , policy management, time management and fun.Paintball India is the original most certain paintball gaming organisation which present 100% safe and interesting paintball gaming. 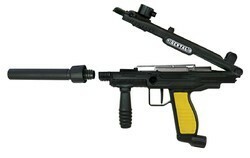 Action Paintball deals in all types of paintball equipment. including guns , barrells, co2 cylinders, hoppers, safety maskis, safety wear. 1 of the best types of paintball markers available is the Tippmann custom 98 This is a very sturdy and reliable marker and is best for rough or field use.